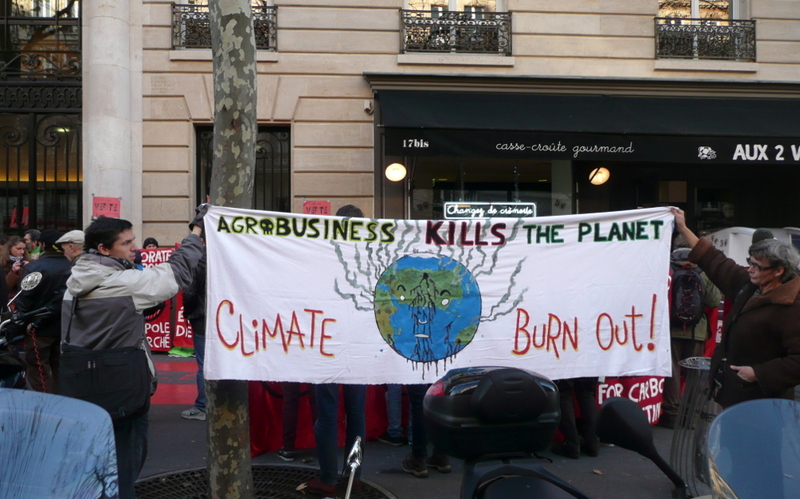 Stop the livestock industry and its lobby at COP23! 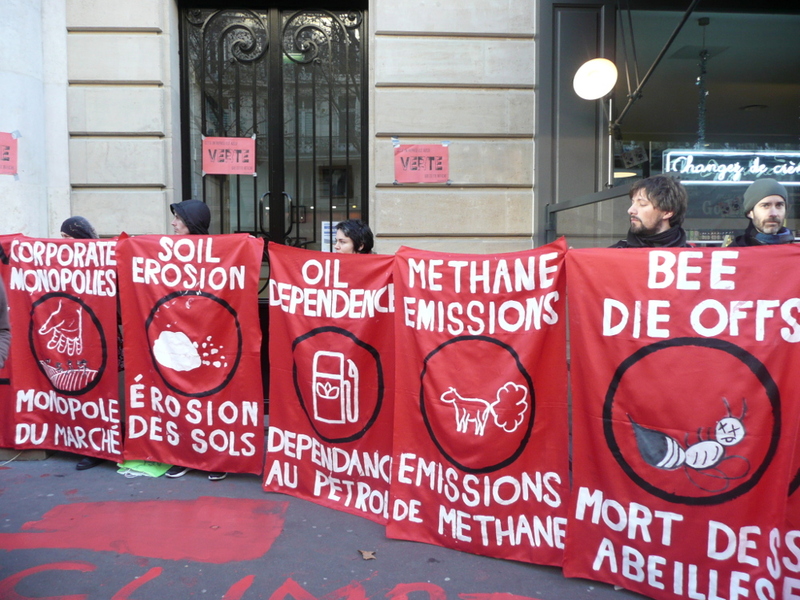 DVT: stop facilitating climate change! The global food system accounts for 29% of today’s global greenhouse gas emissions. Livestock now generate more greenhouse gas emissions than all the world’s transport combined. Organic farming can sequester carbon, providing a potentially powerful tool to help us address climate change. 10,000 medium-sized organic farms can store as much carbon in the soil as we would save if we took one million cars off the road. Meeting point: in front of the office of the DVT at the Beueler Bahnhofsplatz (east side of the Rhein). The DVT is the German animal feed lobby. End point: People’s Climate Summit (in the Wissenschaftszentrum in the Ahrstraße). We plan to arrive at around 13:30. If you want to help or have questions, please contact <climate@aseed.net>. Organised by AniCA, ASEED and friends. Global agriculture accounts to one fifth up to one third of global greenhouse gas emissions. Additionally, agriculture has diverse consequences on further planetary boundaries such as for instance the land usage, the biodiversity and the nitrogen cycle. These impacts also lead to an intensification of climate change and make it harder to mitigate its consequences. Animal production makes a large contribution to these consequences of agriculture – and especially the production of animal feed plays a central role. In comparison, animal production only contributes little to world food and benefits mainly the wealthy world population. The production is paid with the desertification of huge areas, the ever ongoing emergence of multiresistant germs, the extreme exploitative working conditions even in the industrialized north and, not least, the exploitation of non-human animals: countless billion terrestrial animals and trillions of aquatic animal fall victim to animal production every year. Animal feed has a substantial share of in these problems. In the course of industrialization, pasture feeding was increasingly replaced with intensive livestock farming. A lot of large farms emerged, concentrating a large amount of animals on a small space. In general, these farms do not have sufficient agricultural production land for the production of the required animal feed. That’s why it’s also called “landless animal production”. For the production of animal feed, resources such as land and water are used that could be used directly for the production of plant-based food instead of utilizing them in animal production. In the light of that, animal production constitutes a wasteful food production. For the production of one calorie of food from animal origin, depending on the animal species and the husbandry conditions, about 1.5 up to 21 calories of plant-based food are required. As a consequence, the land- and resource-expenditure can be reduced significantly through the direct production of plant-based foods. Additionally, almost half of the greenhouse gas emissions of animal production originate in the production of animal feed. This share can be reduced significantly by adapting a plant-based food production, while the direct emissions of animal farming could be cancelled. Also regarding the water consumption, animal feed depicts a stark waste. For the production of one kilogram of beef, on average 16,500 litres of water are used, especially referable to animal feed. For one kilogram of pork or cheese, 5,000 litres of water are consumed. In contrast to this, roughly 2,500 litres of water account for the production of one kilogram of soy beans, and 130 litres with regards to potatoes. In the course of globalization, animal feeds are being transported on ever larger distances and in ever greater quantities. A large share of the protein-rich animal feed fed in Europe originate from Latin America. There, a variety of problems are connected with the production. For the steady expansion of the cultivation area, large areas of rain forest are being cleared – with long-term negative consequences for the climate, the biodiversity and the landscape. At the same time, animal feed is often grown in monocultures and with the aid of sometimes massive amounts of genetically manipulated seeds and pesticides. Many former relatively sustainable acting peasants are being deprived of their basis of existence by the aggressive expansion of producers, and the workers in the animal feed production often suffer from precarious working conditions. In addition, where the imported animal feed is being fed, often a surplus of nutritious slurry arises, which leads to oversupply of nutrients (eutrophication) in several areas. As a consequence, this leads to a negative impacts on the biodiversity, the capacity of water bodies to absorb carbon dioxide, and the drinking water supply for humans. To counter the bad publicity the animal feed industry came of with some labels like the “GMP+”, the “Round table on Responsible Soy” and the “Global Roundtable on Sustainable Beef”. All those initiatives are in the best case leading to some marginal improvement but are mainly meant to greenwash inherent harmful activities and to secure the business model of the industry. Fishmeal, meaning dried and ground parts of fish, depict another form of animal feed, which is predominantly used as addition in aquaculture as well as in pig and poultry feed. Transfiguring, it is often alleged from the producing corporates that fishmeal is merely produced from by-catch. But especially in the last decades, the fishmeal production emerged as a new branch of deep-sea fishery, such that specific species of fish are solely caught for the production of fishmeal. As such, the production of fishmeal is a central cause for the extinction of species of fish and the overfishing of some maritime locations. Similar to the import of soy, main supplier of fish meal are the Latin American countries. The processing of fishmeal has catastrophic consequences on site, both for the people and the environment. Regularly, it becomes publicly known that chemically polluted waste materials from fishmeal plants are being carried directly into the sea, without any filtering. Additionally, local residents suffer from skin and respiratory diseases due to the incineration of fishmeal dust.